On December 21st, Raoul Wallenberg Institute of Ethics Program Director, SARAH Advisory Council member and United Religions Initiative Global Council Trustee Rebecca Tobias presented the Roerich Banner of Peace to luminaries, visionaries, activists and, what some call modern-day-prophets at Birth 2012 in Los Angeles, CA. In her words, Rebecca explains the Banner, "This ancient universal symbol is one of the world's oldest. Its three spheres were designated by Nicholas Roerich, the designer of the banner, as the synthesis of all arts, all sciences, and all faiths within the circle of culture. Wherever the Banner is displayed, it recognizes the great achievement of the past, the present, and the future. It encourages the individual to strive to fulfill his or her highest potential, beautifying all aspects of life; it encourages each person to take responsibility for the evolution of the planet; it signifies the peace-builder; and it symbolizes the transformation of the individual and of society. It represents cooperation-the cornerstone of the emerging planetary culture-in all aspects of human activity. arts, all sciences, and all faiths within the circle of culture. as the common heritage of humanity. nomination for the Nobel Peace Prize. On April 15, 1935, President Franklin D.
twenty Latin American countries joined the U.S. in signing this historic document. propel their spirits to the task of Peace-building, thus ensuring a radiant future." 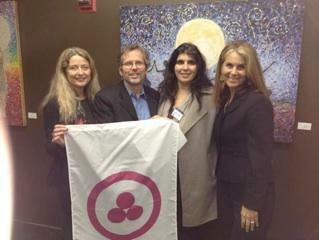 Rebecca Tobias, Phillip Hellmich (Director of Peace-The Shift Network), Roya (of the Agape International Spiritual Center) and Sande Hart with the Roerich Banner of Peace on 12/21/12 at Birth 2012 Also receiving the Banner was Steve Dinan (The Shift Network) Rev. Michael B. Beckwith (The Agape), Sister Jenna (Brahma Kumari's Washington DC Director), Johnathan Human of UNIFY and James O'Dea (Decloration of Commitment to Indigenous Peoples 2012). The Banner has also been received in The Holy Land for UNIFY's A Global Call for Peace.